The NF 4500 Series Precision Power Amplifiers are DC amplifiers which output ±200V and cover the frequency range from DC to 20kHz while the 4521A Power Booster offers ±200V output voltage and 16.7Arms output current. 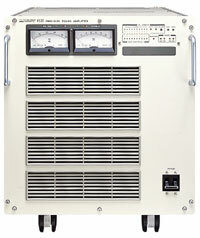 The 4500 Series Precision Power Amplifiers are available for a constant current output and a remote sensing. It is appropriate for power environments testing by non-sinusoidal waveform like instantaneous break of half wave.